Sir Walter Scott’s 1819 epic medieval novel Ivanhoe was brought to the big screen in 1952 as a gorgeous Technicolor adaptation released through Metro-Goldwyn-Mayer Studios. Like many medieval films of the era, it combined romance, drama, and a good deal of swordplay into an adventure-packed 100-minute runtime. Ivanhoe was first brought to the screen in 1913, as a silent film starring King Baggot and Leah Baird. Surprisingly, it was not filmed again in the 1920s (Ronald Colman missed out on a great opportunity here), nor in the 1930s and 1940s. Finally, in 1952, when Pandro S. Berman undertook to produce it, he hired that old pro at MGM, Richard Thorpe, to direct the film. Thorpe whipped together a scrumptious feast of derring-do and the success of this film lead him to helm several other similarly themed pictures, including The Prisoner of Zenda (1952), Knights of the Round Table (1953), and The Adventures of Quentin Durward (1955), two of which starred Robert Taylor, the titular hero of Ivanhoe. Robert Taylor was “Taylor-made” for roles such as Sir William of Ivanhoe, convincing audiences that he was the embodiment of noble virtues such as bravery, honesty, gentleness, and honor. In this film, he is the famous chivalrous Anglo-Saxon knight who is on a mission to return the imprisoned king, Sir Richard the Lionheart, to his throne which has been usurped by his nefarious brother Prince John (Guy Rolfe). 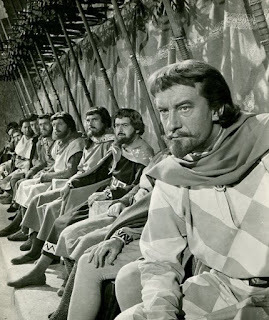 With the aid of Isaac (Felix Aylmer), the old leader of a Jewish community, he collects the necessary ransom amount to free the king but must first clash swords with the knight De Bois-Guilbert (George Sanders) before he sees Richard seated in his rightful place again. 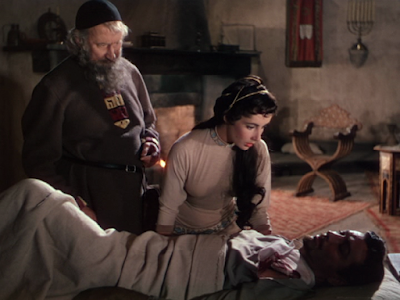 Unlike some studios, Metro-Goldwyn-Mayer never made films in a half-hearted fashion, and Ivanhoe was no exception. It had a budget of nearly $4,000,000 which permitted the cast to be sent to England for interior and exterior shooting at the MGM British Studios in Borehamwood and Ashby de-la Zouch, villages steeped in English history. Alfred Junge designed the interiors of all of the sets, with Roger Furse (Henry V ) providing the scrumptious costumes for the knights and ladies, which included Joan Fontaine as Rowena and Elizabeth Taylor as Rebecca. Elizabeth Taylor was only nineteen-years-old at the time, but so expressive in her acting and certainly the most beautiful actress to ever portray Rebecca. 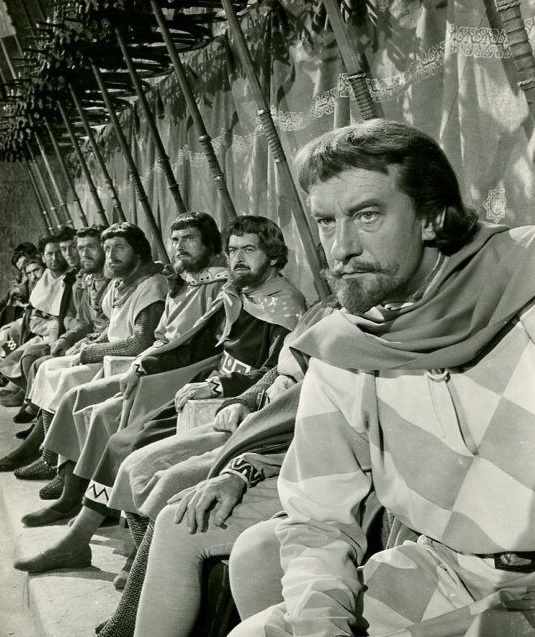 Also in the excellent cast was Emlyn Williams as Wamba, Robert Douglas, Finlay Currie, Basil Sydney, Megs Jenkins, Francis de Wolff, and Harold Warrender as Robin Hood. Some have claimed that Ivanhoe is not entirely faithful to the book, but surely some allowances had to be made for the sake of condensation. The thrill of seeing the story that unfolds onscreen inspires one to read the novel. This should be the aim of any great literary-to-film adaptation, and Ivanhoe accomplishes this. Upon its release, Ivanhoe was a huge earner at the box-office, both in the States and in England, grossing over $10,000,000 in sales. It also triggered the birth of a medieval genre of films that had not been popular since Errol Flynn starred in The Adventures of Robin Hood in 1938.